Previously I have written a review on “AOMEI Partition Assistant”. The Article was about “Free Migrate OS to SSD or HDD with AOMEI Partition Assistant 6.0“. Today I am coming with a new topic on “Free Backup Your System, Disks, and Files with AOMEI Backupper 3.2”. You can easily Backup Your System, Disks, and Files with AOMEI Backupper 3.2. I am giving details with screenshot step by step. Have you ever suffered a lot from data loss? Such as hard drive crash, malware, virus attack, accidental deletion, etc. To ensure the safety of your files, applications, and operating system (OS), backup is necessary for every one of us. 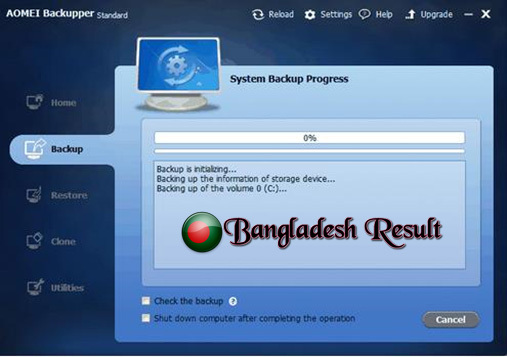 AOMEI Backupper standard is the simplest free backup software protect System & Data of your PC, and it has supported system backup, partition backup, disk backup, file backup and can backup your hard drive to any location that can be recognized in File Explorer. It runs smoothly on Windows 10/8.1/8/7XP/Vista and supports many file system including NTFS, FAT32, FAT16, EXT2, EXT3. Then you will never worry about data loss or system failure in the future. What’s new in AOMEI Backupper (v3.2)? Fixed issue: random crash caused by the frequently backup. Support large window display mode to suit high-resolution computer. Although AOMEI Backupper can backup to a critical volume, it’s always recommended to backup Windows 10 to external hard drive. http://www.aomeisoftware.com/download/adb/BackupperFull.exe. Then click “Backup” on the left side of the interface and then choose System Backup. Step2: AOMEI Backupper Standard will regard system partition as a source, so please choose the external hard drive you have plugged into the computer as destination disk and then click Start Backup. Step3: When the progress is 100%, please click Finish to end operation process. AOMEI Backupper Standard is a potential backup software for a Windows computer. It allows you to create both Windows PE (WinPE) and Linux kernel based bootable disc easily, to be used as rescue media for emergency usage. It is easiest and faster for users, even you aren’t an IT expert. It devotes to protecting data being lost and much safer than other backup software. Try it now, you will be receiving a surprise! great web site and nice information. Thanks to published this post. we be come very helpful this post.